on romance and bountiful beauty. the buckle on the front cover. velvet - so rich and soft! enticing enough to jump into. 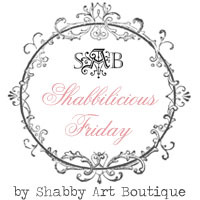 is hosting a party "Shabbilicious Friday"
new journal there today 25th May. and giving inspiration to each other. Suzy that is absolutely stunningly beauuuuuuutiful!!! Yes we are enjoying the warmth of almost-summer up here in the other Land of Oz (Kansas) and enjoying the ever-changing colors as each new tree, bush or flower blooms. Oh Suzy, I am thrilled and can hardly wait to receive my journal. The photos are lovely but I can't wait to touch and feel the lovely layers of softness. Thank you for your kind comments too! Hugs. Your journal is just beautiful what a lot of beautiful fabrics you have to work with I just love all the lovely layers and the images you use. Absolutely beautiful Suzy,every page is a delight. Lorraine will love it. Just gorgeous, Suzy! Luscious layers. Hope you have some sunshine. beauty and amazing art work from you dear friend. So wonderfully textured, so extraordinaire materials all very,very fantastic, and gorgeous. This journal that will soon be hold in the hands of its owner, will give many hours of joy over the beauty you have created, --gorgeous to touch with hand and soul- and to watch with eyes and love. The silk and lace together with wool and velvet makes a stunning mix ,and so very beautiful. Absolutely stunning. What a lucky person this will be to receive such a gorgeous work of art. I am in awe of your talent, Suzy. Hi, Suzy! That is just marvelous! !I've just found your lovely blog, and I'm a new follower...so nice to "meet" you! Stunning, simply stunning, as always, of course, but different, as every piece is. Every one of your journals or creations is a gift of beauty you share with us, I for one, am grateful to have met you and to see your work! I will go to check out the site you recommended. Oh such lovely work! You inspire me. Lorraine will surely treasure it! the journal is simply gorgeous.Love all the layers and texture - what a treasure.You are so very talented my friend. Your new journal is really stunning! I love the way your have "wrapped" the pictures in the beautiful lace and bedded the roses in all those layers of rich lace, silk and chiffon. Beautiful way of using your felting machine. You create with so much love and you are so talented. This is só beautiful! I bet Lorraine is in heaven when she get it! YOU'VE SAID EVERYTHING i WANTED TO SAY ABOUT THIS FABULOUS JOURNAL! Now I'm of to see the blog lady recipient's blog!. Thank you for showing us all this beauty!. Another gorgeous journal. Love all the layers and soft fabrics. Your work with the needle felting is fantastic. The lucky lady who has commissioned the book is going to be so happy. I know I love my wonderful SuzyQu handmade cloth book. Always love coming to see your gorgeous creations Suzy! You are AMAZING!!!! Happy Sunday to you and thanks for the blog ad. I will be working on my list this week and you know you will be on it! Suzy I am inspired every time I come over for a visit! You make me want to jump back in the studio and play although mine never come out as lovely as yours. You rock!! Oh my gracious!! Where to begin!! with each new piece that you create, I see growth and inclusion of new and luxurious textiles!!! Fabulous!! Love how you are using your felting machine- I love how one can draw with fibers and lace when that machine is used!!! I am sure your friend will swoon when it gets to her studio in Canada!!! I discovered your work on Flickr, and then your blog! I love all what you make! Would you allowed me to put a post about you, your art and your blog on mine please? This is so Lovely! The Layering is Gorgeous.I must tell you I have been Playing with the Wonderful Giveaway Bundle you Sent me! Thank You for the Chance for some more Fun! I think this is my favorite journal ever!!!! I just adore all the beautiful layering and roses and silks, velvets, and trims. Lorraine is going to LOVE it!!!!!!! I can never see too much of your beautiful work Suzy dear. Its a delight to come to your blog and look at your beautiful creations over and over again...i must try to make one some day ..got to learn how to start and gatter the laces and other lovely things......this album is so beautiful! !...lucky one who gets it....but i just love the way you have put it all together again....just awesome.....greetings Francien. My heart is beating too fast.... I feel you put your heart and soul into this enchanting journal dear Suzy. It shouts feminity to me and that's what I love most! With these soft fine sheer pretty fabrics you've weaved your magic once again - all of the elements blend beautifully to make the whole. Your friend will be totally 'over the moon' with this and I can see her racing out to the postman everyday eagerly waiting it's arrival! As we are plunged into the summer heat in the USA, the cool mornings on my porch remind me of all the beautiful scenes we see in your pictures. You are all about beauty and class and good living. Thanks for the pictures. --- and the hits just keep on comin' !! Your latest creation is so beautiful- I love the felted flowers that you added-- your friend is going to love this so much! Hi, Suzi. There's not much I can add that hasn't already been written. I liked your use of the old linens and felt. The layering gives such depth. Very pleasing journal. I enjoyed checking out Lorraine's blog as well. I love your works Suzy every piece looks so fantastic!